Argyre, the golden Martyr of Christ, was from Proussa, and the daughter of pious parents. She possessed both a beautiful face and the fear of God. In time the blessed maiden wed. But, the newlywed caught the covetous eyes of a certain Turk in the neighborhood who fell in love with her. He schemed to bring her over to fulfill his wicked intention. Since he was unable to persuade her he slandered her to the judge of Proussa, pretending that she declared a willingness to become a Muslim. The judge immediately imprisoned the Saint. Argyre’s husband considered it more favorable to have the case transferred to the court at Constantinople. However the Saint’s accuser also appeared there and falsely charged her, maintaining the same allegations against the Martyr. Argyre affirmed that she had no knowledge of ever uttering a word denying the Faith, and stated she was a Christian and a Christian she would die. Consequently, by the judge’s order, they beat the Saint and afterwards confined her to prison. Eventually they conducted a second examination, and again they smote, punished, and jailed Argyre. These events occurred repeatedly throughout the next seventeen years. O, her courageousness! Even inside the prison the Saint met with constant troubles and insults from the Turkish women inmates who were in detention because of their criminal actions. The devil incited them to harass Argyre through excessive affliction and torments. Nevertheless, the ever-memorable one withstood everything magnanimously, by the love and yearning she possessed for her Bridegroom Christ. Perhaps you wonder whether this was all? But in addition to this, she herself subjected her body to fasting, bore every trial and underwent hardships just as the other multitudes of Christian women who were also prisoners with the Saint in that very jail. The heart of blessed Argyre was filled with exceeding joy and such thankfulness, since she was imprisoned for Christ, that she thought discomforts were conveniences. Such was the case that when the pious Christian, Manolis Kiourtzibasis, the maker of fishing nets, succeeded in having the charge against her withdrawn so she could be at liberty, Argyre did not assent to the reprieve but regarded the prison to be the king’s palace, Thus, incarcerated and in bonds for Christ, she ended her life receiving the imperishable crown of martyrdom in the year 1725 (April 5). Then the Christians took possession of her holy relics and buried her in a place called Haskoy. At the uncovering of her relics after three years her sacred body was discovered whole and intact, emitting an unspeakable fragrance. O, the wonder! The priests and Christians received it with great devotion and placed her within the Church of Saint Paraskevi by permission of the then most holy Patriarch Paisios. To this day, her hallowed relics exist and are venerated by patriarchs, archbishops, notable people, and all Orthodox Christians, to the glory of Father, Son and Holy Spirit. Amen. In 1955 a riot ensued in Constantinople and thousands of Greeks were forced to flee from their homes by the Turks. Among the victims was St. Argyre whose relics suffered a second martyrdom by being burned after the church was damaged. 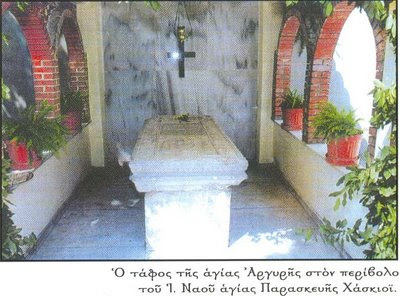 The faithful salvaged the relics and brought them to Mytilene where they lie to this day. The transfer of her relics is what is celebrated every year on April 30. Her regular feast day is on April 5. 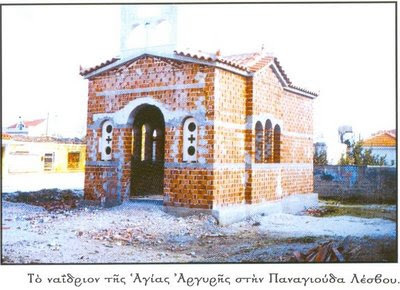 According to the author of the source site, when the people of Panagiouda were in the process of building the above chapel of the Saint, St. Argyre appeared in a dream to the priest, Fr. Theologos Sakales, and told him: "When you make my icon for my chapel, don't make it like this one here, but depict me holding the two stefana (crowns) of marriage." True to her guidance, the icon above depicts St. Argyre holding both the Holy Cross of a martyr and the marriage crowns as a defender and patron saint of marriage. St Argyra's name comes from the Greek word for silver (argyre). From The New Martyr Argyra 1688-1721 by P. Philippidou (which also contains a Service to the Saint) was published in Constantinople in 1912. You put to shame tyrants by your tortures, O pure one, and you were shown forth, O much-suffering one, as strong as a diamond. O glorious martyr of Christ, you showed forth in struggles for Christ the Savior, love and zeal and unquenchable longing, Who worthily glorified you, O Argyre.